Begin marketing right away using these offical ALNC marketing tools. Learn how to utilize the proven LNC STAT marketing system that uses modernized and more effective methods, not outdated methods like tri-fold brochures. Proudly display the official ALNC logo and be an ambassador for one of the most respected Legal Nurse certifications. If you are serious about launching your ALNC business into success, these marketing tools are what you need. Work with marketing experts to develop your own custom logo and business identity. 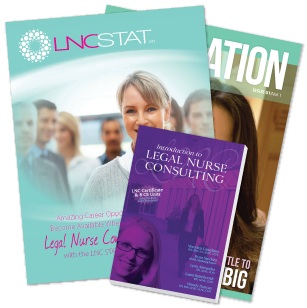 Access the most effective marketing available for Legal Nurses when you utilize the proven LNC STAT marketing system with the Exhibitor's Set. An unbeleivable 100% of ALNCs who have exhibited at attorney conferences have secured multiple cases.